Bullying is aggressive behavior among school-aged children that involves a real or perceived threat. Bully behavior is typically repeated and has the potential to escalate over time. Kids who are bullied and who bully may have serious, lasting problems. It’s important to recognize the signs that your child may be a victim of bullying. There are three types of bullying – verbal, social, and physical. Bullying happens most often at school and on the Internet. Unfortunately, most children have been bullied or have taken part in bullying. Behavior on both ends of this spectrum has the ability to cause lifelong damage. Children who are on the receiving end not only suffer academically but often struggle with depression and anxiety well into adulthood. Being aware of the signs can help adults empower children to respond effectively and appropriately. If your child begins spending less time with friends or you notice that their friends have changed, they may be being bullied at school. When a child is bullied, other children tend to separate themselves from them as a form of self-preservation. They don’t want to be bullied either so they disassociate from the situation and from the person being bullied. Children who are bullied may become anxious, angry, or easily upset. It’s difficult to deal with the stress and isolation that bullying causes and it can be overwhelming. 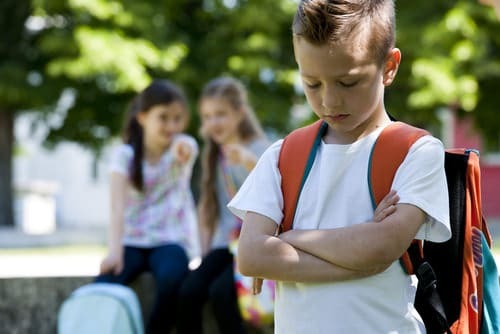 As bullying progresses, a child may try to avoid the situation in which they are being bullied. They may pretend to be sick to avoid going to school. Additionally, chronic stress impacts the immune system. Your child may experience actual headaches and stomachaches as a result of bullying. If your child seems to be ill more often than usual, it’s time to start asking questions. The best time to start talking about bullying is during the elementary school years. It’s important for your children to know that they can talk to you about anything. Children often keep the fact that they’re being bullied to themselves because they feel like they should be able to handle the problem on their own. Additionally, many children simply don’t trust adults to handle the situation appropriately. If you think your child may be dealing with this kind of aggression, begin by doing research. Ask questions about who they eat with, who they sit with on the bus, and who they like and don’t like at school. How much time are they spending on the Internet? Take note of changes in behavior after your child spends time on the computer. Talk to your child’s teacher to learn more about who they hang out with at school. It’s also okay to be direct with your child. Ask them if there are children who are giving them a hard time, isolating them from activities, calling them names, or taking their belongings. While you may not be able to solve all of your child’s problems, bullying is one problem that needs to be addressed. Your child needs an advocate who will supply them with the healthy tools to deal with this type of aggressive behavior.